A surveillance video apparently shows several American swimmers, including Ryan Lochte, returning to the Athlete’s Village in Rio de Janeiro on Sunday morning. The surveillance video was obtained by MailOnline. In the clip, Lochte and three other Americans can be seen returning to the village, and Lochte can be seen playfully hitting swimmer Jummy Feigen over the head. Swimmers Gunnar Bentz and Jack Conger could also be seen. 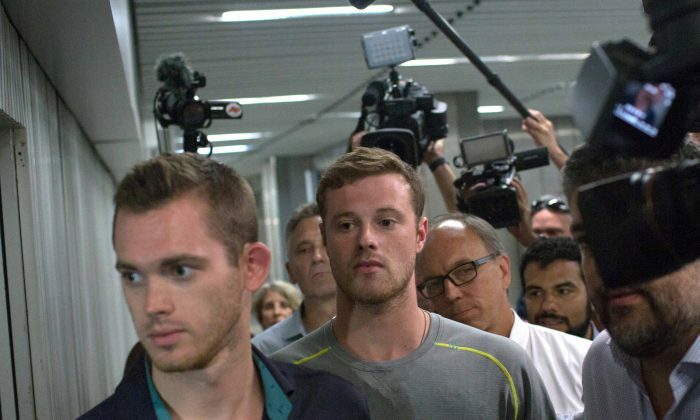 A public prosecutor said that the four “arrived with their psychological and physical integrity unshaken.” Judge Keyla Blank ordered Wednesday that Brazilian police seize the passports of Lochte and Feigen to force them to stay in Brazil for further questioning. “The more than calm behavior of the athletes straight after the supposed violence, together with other details present in the inquiry, makes me believe that more investigations should be undertaken into the possible false communication of a crime,” the prosecutor wrote. Blank said that there were also inconsistencies in Feigen’s and Lochte’s testimonies regarding the gap in time between when they France House, and when they arrived at the Olympic Village, USA Today reported. Lochte’s lawyer and father says the swimmer returned to the United States. On Wednesday, Rio police went to the Athletes Village to question Lochte and Feigen, reported CBS News. Lochte’s lawyer said he’s now back in the U.S. and cooperated when he was questioned by police in Brazil. Feigen, however, hasn’t returned home. Federal police said they were told not to allow him to board a plane.